A well-equipped amateur astronomy club sets up for a fun star party in Santa Cruz, Calif. If you or your local astronomy club have ever thought about conducting a "star party," allow me to offer some tips. I have been involved in scores of such sessions, spanning nearly a half-century, so let me also share a few examples of what you might expect to encounter. Astronomy is considered the oldest of the sciences. So amateur astronomy may very well be the oldest of the scientific hobbies. I've frequently had the chance to help others learn the hobby. On occasion, a scoutmaster might ask me give his or her troop a tour of the night sky. I also help with organized events in which the general public is invited (through the local media) to peer skyward through different telescopes. I enjoy these kind of gatherings even more than spending time under the stars alone. Even if you live in an urban area, try to find a location that offers as wide a view of the sky as possible, free from obstructions such as tall buildings. There is, however, another problem that affects observers all across the world: light pollution. Extra lighting is causing an astronomical dilemma that affects even the most amateur of stargazers. Light pollution can be traced to excessive or misdirected outdoor lighting. Sadly, in many large metropolitan areas, it is becoming increasingly difficult to trace out even a simple star pattern like the Big Dipper. As such, it might be necessary for you to travel to a darker location to see the stars. You might have to travel only 15 or 20 minutes, or perhaps as much as an hour or two. If you're interested in how you can reduce extra nighttime lighting in your own town and backyard, you or your astronomy group might consider joining the International Dark Sky Association (IDA). Founded in 1988, IDA gathers and disseminates light-pollution information and solutions. Indeed, the association has played a pivotal role in turning the tide in the war against light pollution. For more information, go to the IDA Website at http://darksky.org/. Invite people to arrive at your selected site before it gets dark. In a way, this is like coming to the theater before a play or movie begins, taking your seat and controlling the rush in great anticipation for the expected script. You soon will soon be able to see a wide variety of objects such as the moon and the five naked-eye planets, not to mention star clusters, galaxies and the passage of artificial satellites (the biggest and brightest being the International Space Station). Just about any clear night provides an invitation to go outside and see what's up. Some nights, however, will offer up a special attraction: a meteor shower, a comet, a beautiful conjunction between the moon and a bright star or planet, or even an eclipse of the moon. And if nature is really in a show-off mood, perhaps you'll get an unexpected display of the northern lights (also known as the aurora borealis). "Learning the stars is a pure delight, and there are many pleasant ways to do it. No true stargazer will fail to become familiar with the constellations, and fortunate is he whose introduction to the skies comes to him through nature's eyes alone and not through any telescope. So few of those who use the eyepiece first ever get to really know the stars." So, as darkness is falling and before your telescope (or telescopes) have been fully set up, first spend some time under the stars with just your eyes. Get your audience acquainted with the brighter stars and constellations. Some folks will no doubt bring flashlights with them, so you might want to have some red cellophane or red plastic to distribute to your visitors. Covering the flashlights with a red filter will keep everyone's eyes dark-adapted (white light, by contrast, will shrink the pupils of your eyes). Use a rubber band or scotch-tape to affix the red material across the front of the flashlight lens. Then, after you point out the more prominent sky objects, you can direct your audience to look at a particular object through your telescope. And if there are other telescopes set up, all the better! In an organized stargazing affair, you're likely to overhear remarks coming out of the darkness like: "What are those funny bumps in the middle of the moon's craters?" and "I can't believe those are the rings of Saturn!" If participants at your gathering own their own telescopes, but experience problems, they're in the right place. There is no better setting than to a star party to get assistance and helpful suggestions with your telescope. Besides, there is also the camaraderie of spending time with other people from different walks of life who all share the same love for the nighttime sky. One of the best parts of a public observing session is helping someone who has a scope but doesn't know how to use it. When the gear is finally set up properly, the look on the owner's face after first light is priceless. What one person lacks in telescope skills is made up by another. One person might know the sky well and can suggest targets, while another can help with the setup, and so on. The stars offer solitude, to be sure, but two people observing together will, synergistically, often accomplish more than two people observing independently could do. In almost all cases, two heads (or more) really are better than one! If you plan on pointing out stars and constellations at a star party, using your index finger in the dark is simply not going to cut it, especially if you have a large group of people surrounding you. If you've ever visited a planetarium, no doubt the lecturer used an electronic pointer to project an arrow onto the planetarium dome and point out the stars. But is there a way to do that in the real sky? There's no "dome" outside to project anything against, of course, but you can point toward objects. One popular device is the laser pointer. There is a class of lasers, IIIa, which by law must be less than 5 milliwatts (of measured optical output, not electrical input). These lasers will work to help you point out night sky objects. The best options can cost around $60. Please note that these laser pointers should be handled responsibly. It is legal to operate the devices the U.S. provided you don't try anything dumb, like shining one at an aircraft in flight. Pilots exposed to a laser during final approach to the runway can experience retinal burns at distances of up to 14 meters (50 feet), as well as flash-blindness, afterimages or glare problems at up to 350 m (nearly a quarter mile). Even at a range of 3 kilometers (2 miles), a laser pointer can still interfere with a pilot's vision badly enough to prompt an aborted landing. If you are caught pointing a laser pointer at an aircraft, depending on what state you live in, you can face a fine in the hundreds of dollars for a first offense. A second offense might land you in jail. In 2005, a New Jersey man faced the possibility of a 20-year prison sentence after he shined a green laser at a commercial jet and then at a police helicopter dispatched to search for him. Initially, the man blamed his 7-year-old daughter, then confessed that he was pointing out the stars to her. He eventually received a reduced sentence of two years' probation. You can avoid such a scenario for yourself by never shining a laser pointer toward any person, aircraft or moving vehicle, and do not aim a laser pointer skyward if you see or hear an aircraft at any time flying overhead. Also, do not use a laser pointer if you are within 3 miles (2 km) of an airport. Otherwise, you can use a laser pointer to give guided tours of the night sky, so long as you use common sense! If you prefer to avoid using a laser pointer, you can opt for a device that was commonly used before the "laser era" took hold, namely a flashlight. A three-cell flashlight is quite adequate for casting a noticeable light beam into the sky. I personally like the larger, five-cell flashlight, which is usually equipped with a bright xenon bulb. You can adjust the width to a rather narrow beam, which will serve as an excellent pointer to whatever object you're viewing. If you have a telescope and don't already belong to an amateur astronomical organization, local or national, you ought to join one. Do this not only to make new friends and swap ideas, but also to get help and advice if you need it, and stay posted on developments in your particular interest in astronomy. 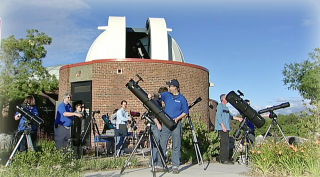 By far the largest national organization of amateur astronomers is the Astronomical League (AL) (https://www.astroleague.org/al/general/society.html). Its member clubs hold annual and regional conventions at which amateurs talk shop and exchange useful ideas. The AL is composed of scores of local amateur astronomical clubs and groups, totaling thousands of individuals. And lastly, perhaps you might like to bring along some music to listen to while you're out under the stars. One of my fondest memories goes back more than 40 years ago when I was watching the Perseid meteor shower with my family on a balmy summer night from my Bronx backyard. My grandmother brought her portable radio and tuned in a local station that ran an overnight program of classical instrumental music called "Music 'til Dawn." That musical accompaniment in the background, plus the view we all had of the sky on a startlingly clear night, combined with the occasional streak of a "shooting star," made for night I will always remember. If you're planning to throw your own star party soon, good luck and clear skies!